WARNING: A few spoilers ahead. So far, this is the best movie qua movie on the financial crisis. It's a tense little drama, only encompassing about 24 hours, with mostly excellent characters, writing, pacing, acting, and directing. I won't go into too much detail; others have already done that better than I could. I will say a few words on the actual nature of the crisis, which is revealed in some very subtle and pleasing ways. First is how the further up the food chain you go, the less people in the firm understand how their business actually works, and as a consequence don't really have a good grip on what kinds of risk the firm is taking. The CEO tells the financial wizard who figures out what is going to happen to speak to him like a "small child." On a related point, when one of the few characters with a flickering of a conscience (the same wizard) lays out his impressive background in physics, we get a glimpse of how Wall Street has, through preposterously high salaries, strip-mined America for her best minds. And these geniuses, in the end, end up engineering financial Armageddon. The CEO makes a great speech trying to justify his huge sell, laying out 400 years of repeated financial crises and saying "We can't help ourselves." However, there were a few details one might include as a footnote, to make sure people don't take away the wrong impression. The first, and maybe most important, is that no large bank in America would have survived the crisis alone. 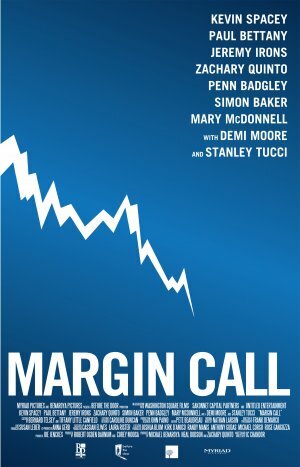 Margin Call sort of implies that the (fictional) firm has saved itself by starting a financial panic, but in reality all the big banks had to be rescued by the government. The one that didn't, Lehman Brothers, went bankrupt—actually, that is what touched the whole thing off. Second is that the collapse of the subprime mortgage bond market is portrayed as a complete surprise. That may have been the case in some firms, but a lot of them saw it coming, at least a bit in advance, and tried to profit from it. Finally, I don't think it would have been possible to make the big sell shown near the end. Like when Long-Term Capital Management went down in the 90s, these guys were such a large part of the market that if they had tried to unwind in a single day it would have been flatly impossible. Really niggling details though, especially for a Hollywood drama. Overall, highly recommended.